The true workhorse of the Baileigh Industrial line oftube benders is the RDB-350-TS. Designed and built in the USA to stand up to the rigors of production at any shop. This bender has the capacity to bend 2.5” schedule 40 pipe and up to 3” tube with a .187” wall thickness. As with all Baileigh Industrial tube benders, the RDB-350-TS accepts Baileigh Industrial's standard drop on tooling. And if you have a unique application, Baileigh Industrial can make just about any custom tooling that your application will call for. The RDB-350-TS also features one shot bending to 360° both left and right. 180° bends can be achieved in about 16 seconds. Quick release counter die system allows maximum efficiency because the pipe bender can be loaded and unloaded quickly for high production runs. The RDB-350-TS has a user friendly touch-screen controller that allows the user to store up to 170 programs within the memory of the controller itself and unlimited program storage/back up via micro SD port (standard 2CB SD card, max, with up to 10 bends per program. The RDB-350-TS can be programmed for desired angle, spring back for the material, and speed of the bend. Rotational orientation can also be kept track of within the programmer. Another unique feature of this pipe benderis the 320° rotation of the controllers head. This feature allows the RDB-350-TS to be operated from any location around the machine. 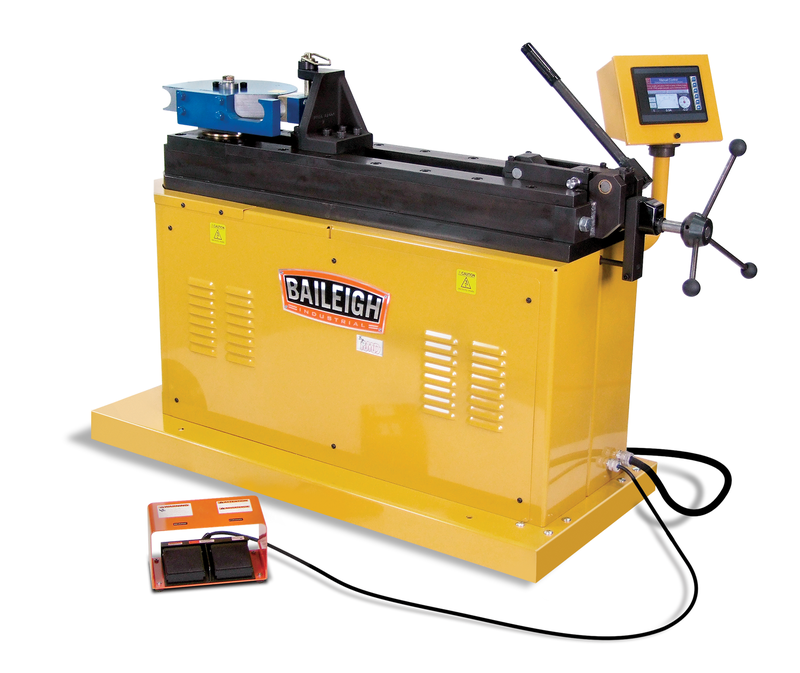 Like all Baileigh computer controlled tube and pipe benders, the RDB-350-TS can accept a rotary positioning table. This table is available in various lengths for repeatable bends in a single piece of material. When the table is attached to the tube bender, it helps achieve very accurate bends in varying planes, as well as consistent measurements between bends. 69" x 32" x 46"